AthletePromotions books Orlando Magic players for corporate appearances, speaking engagements and autograph signings. 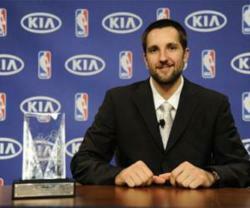 Ryan Anderson proved to be the “one” this NBA season as he was awarded the 2011-12 Kia Most Improved Player. Orlando’s Ryan Anderson won the voters over with his career highs in scoring (16.1 ppg), rebounds (7.7 rpg), field goal percentage (.439) and free throw percentage. Compared to the 2010-2011 Season, Anderson increased his scoring by 5.5 ppg and his rebounds by 2.2 rpg. Anderson has always conducted himself like a business as he declared himself eligible for the 2008 NBA Draft and elected not to take an agent. This left him the option to return to the University of California, Berkeley if he withdrew his name from the draft before June 16. This proved to be the right career and business move as he was drafted #21 overall by the New Jersey Nets in the first round. Anderson’s business savvy, marketability, and impressive 2011-2012 NBA season have him at the top of the list for company endorsements. Look for companies like Gillette, Nike and Kia to jump on board as they are known to sign emerging top athletes. AthletePromotions is a sports marketing firm and athlete booking agency securing thousands of athletes for speaking engagements, corporate appearances, product endorsements, autograph signings, spokesperson campaigns, celebrity golf tournaments, VIP Meet & Greets and more.